As you know, I worked with petmate in the past and I love their products. If you are an animal lover and you want high quality products, you will love them too. I recently had the chance to work with them again and I am completely satisfied with what I received. Petmate, with its family of brands, is the trusted authority in smart pet care solutions. As the first to provide a safe and comfortable alternative to wooden travel crates, Petmate has gone on to introduce smart solutions for every stage in a pet’s life. At Petmate, we believe in what we do, because we have pets too! Check out all of the other great brands and products in the Petmate family: Bamboo, Fat Cat, Booda, Petmate and Aspen Pet. Petmate has a variety of products on their site. Even though you cannot buy directly from their website, you can add items to your wish list, print it out and head to your local pet store to see if they carry it too! 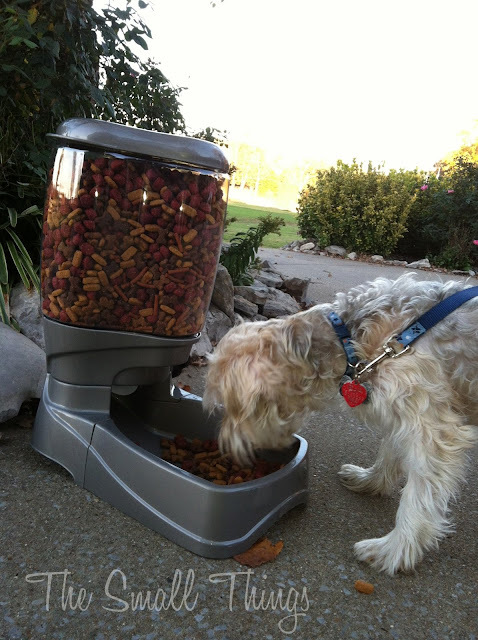 We received the Portion right food dispenser for review, I knew my mother in laws dog, Murphy would love it. She needed something that would keep the other dogs and animals away. This food dispenser is a new product to the petmate family and I am very happy we received it. Chipper wanted to try it out too. 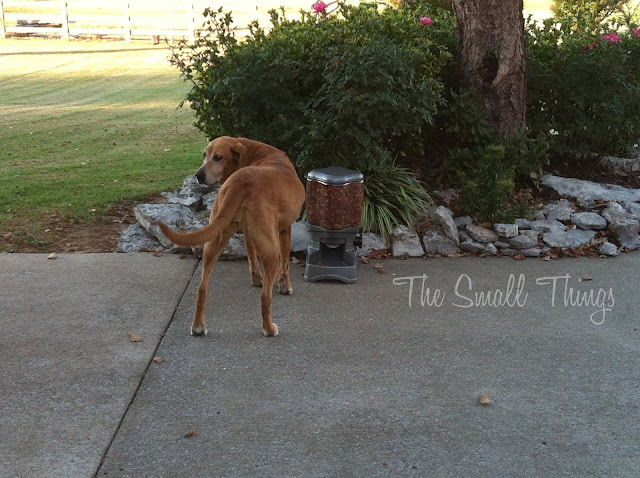 The portion right food dispenser can hold 10 lbs of dog food. You simply put the tray on it, fill it with dog food and turn the knob. You can control how much your dog gets and it is not messy at all.I am sure you can use this for dry cat food too!! I would not recommend putting moist food into it, only dry food. You do not want to get food stuck and clog it up. Overall, we love it! Head on over to your local petstore and see if they carry it. Visit the Petmate website and follow them on Facebook and Twitter to keep up with the latest happenings and news! 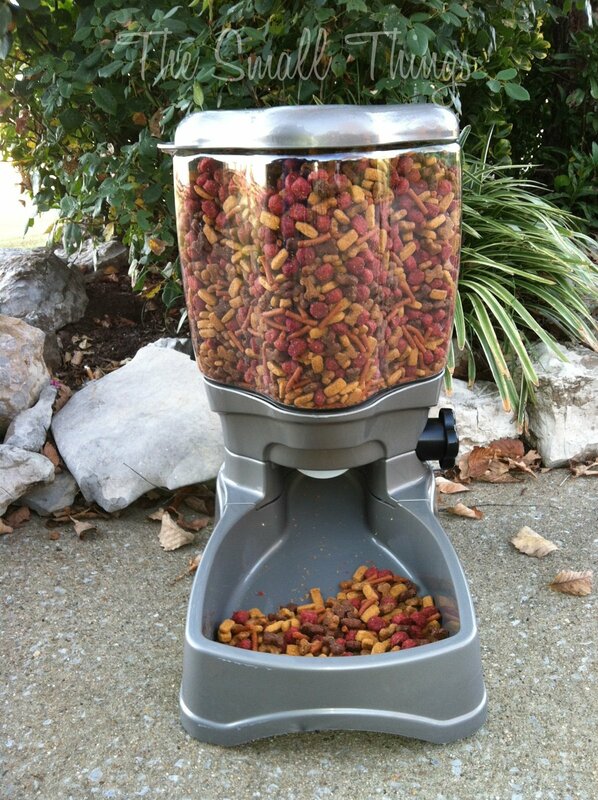 One reader will get to win this portion right food dispenser! Giveaway ends 11/26. Winner must be in the US only. Completing every entry will increase your odds of winning. Must enter with the Rafflecopter below. Goodluck! ( GIVEAWAY CLOSED Form has been removed) The Small Things was not paid for this review. I received the food dispenser and gave my honest opinions in return. All thoughts are my own and may be different from others. I want to get the infinity water. I would like to get the Burrow Bed!! id love to get the infinity water! I think that the classic collection loungers for dogs are so comfy and relaxing looking bed! The portable pet home for dogs. A framed bed would be nice! stainless steel replendish waterer, cause it seems like my dogs go through a lot of water. I also like the eco-friendly plush toy for dogs. Thanks! Gosh I really like the 2 door kennel for cats. Would make it so much easier to stuff my cat in thru the top with the bigger opening. LOL! She's not too fond of car rides. i would like to get the cat scratch wheel,i think my kitties would like it. I would love the pet steps for my pet pig! I would love the infinity waterer!! Would be wonderful in my home with 4 dogs!!! I would love to get one of the heated cat beds for my old man cat Odin. This would be awesome if I still had my cat, but any dog that I have ever had would either figure out a way into it or eat their way into it. My cats need this. They eat a lot. Thank you for this review.